BACK FOR 2019 AND BETTER THAN EVER – CHECK OUT THE NEW THRUXTON R 1200! 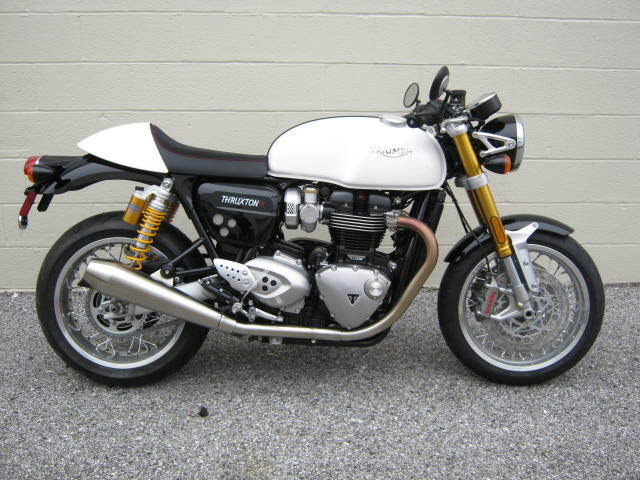 The all-new, next generation, Bonneville THRUXTON R (yes, the one you have been reading about in the trade pubs for months) is HERE and IN-STOCK finally! Redesigned from the ground up with new engines, drivetrains, updated frame technology, ride-by-wire throttles, slip-assist clutches, multiple and switchable ride modes, heated grips, and the list goes on and on and on! Crafted to be the highest standard of detailing, quality and finish, and matched by the capability and performance of a truly modern classic, the new Thruxton is powered by the all-new 1200cc high-power engine providing refined handling and comfort from a purposeful chassis and tuned suspension. Original iconic styling is retained but also enhanced with distinctive cues from Bonnevilles of yesteryear. A giant leap forward without forgetting where it came from is the ultimate compliment.